Brazilian President Bolsonaro Withdraws From U.N. Compact On Migration Nearly 30 countries, including the U.S., had refused to sign the non-binding contract in December. Brazil's administration has promised to defend "national sovereignty." Brazilian President Jair Bolsonaro, pictured on Monday delivering a speech, has withdrawn his country from a United Nations compact on migration. In his second week in office, far-right Brazilian President Jair Bolsonaro has pulled the country out of a U.N. migration pact, fulfilling a pledge he made before taking office. Brazilian diplomats told local media on Tuesday that the country officially left the agreement. A diplomat also told Reuters that Brazil has exited the pact. Bolsonaro appeared to confirm the withdrawal on Wednesday, tweeting, "No to the compact on migration." "Defense of national sovereignty was one of our campaign's banners and it will be a priority of our government," he wrote. "The Brazilians and immigrants who live here will be safer under rules that we ourselves make, without external pressure." Brazil's departure from the Global Compact for Safe, Orderly and Regular Migration marks the latest rejection of the non-binding agreement, which has drawn protest across the world, especially from far-right politicians in Europe. Nearly 30 countries, including the United States, refused to sign the pact in December. Brazil was among the majority of countries that signed onto the compact, under the country's previous administration. Bolsonaro's decision to leave the agreement follows guarantees the president-elect and his foreign minister made last month, after a polarizing election and runoff. "The Bolsonaro government will withdraw from the Global Compact on Migration being launched in Marrakech, an inadequate instrument for dealing with the problem," tweeted Ernesto Araújo, now the country's foreign minister, in December. "Immigration must not be dealt with as a global issue, but rather in accord with each country's reality and sovereignty." More than 700,000 registered immigrants live in Brazil, according to the Migration Policy Institute, along with several hundred thousand more undocumented immigrants. By far the largest segment comes from Portugal, followed by Japan, Italy, Paraguay and Bolivia. Meanwhile, Brazil has become one of the primary destinations for an increasing number of Venezuelans fleeing a political and economic crisis at home. At least 65,000 Venezuelans have sought asylum in Brazil over the last four years, according to the United Nations High Commissioner for Refugees. Geoff Ramsey, assistant director for Venezuela at the Washington Office on Latin America, told NPR last fall that about a dozen tent camps were operating on the Brazilian-Venezuelan border. Last month, Araújo tweeted that Brazil would "continue to welcome" Venezuelan asylum-seekers even when it withdrew from the compact, though it would also focus on the "restoration of democracy in Venezuela." The U.N. accord has become a focal point for anti-immigrant sentiment, particularly in Europe. Marine Le Pen, leader of France's far-right National Rally, called the agreement "a pact with the devil." And in Brussels last month, thousands of protesters took to the streets carrying anti-immigration banners as they rallied against the pact. The Trump administration refused to participate in the agreement more than a year ago, while other countries agreed to the pact last summer but pulled out before it was formally adopted, including Austria, Hungary, Italy, Chile and Australia. 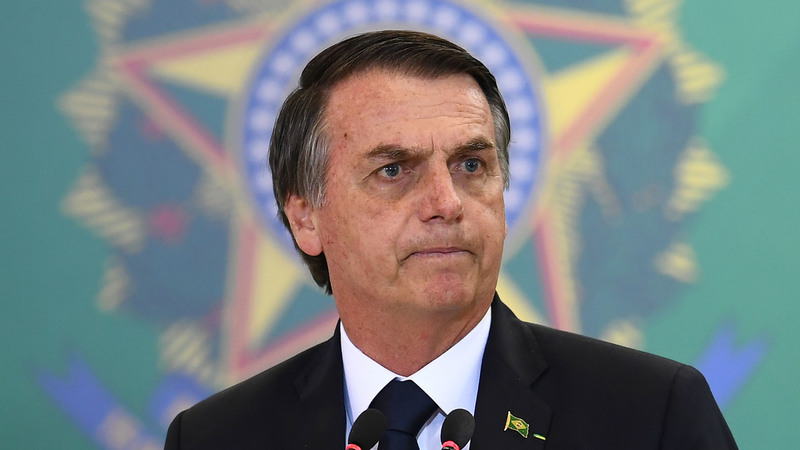 Bolsonaro's government, now just over a week old, has drawn comparisons to the current U.S. administration, including in its rhetoric on refugees. On Wednesday, the Brazilian president echoed President Trump's language comparing national security to home security. "If we decide who we let into our own houses, why would we do any differently when it comes to our Brazil?" he tweeted. In a televised address on Tuesday night, Trump argued for his proposed border wall by pointing out that "wealthy politicians build walls, fences, and gates around their homes." Bolsonaro has taken his victory as a "mandate" to change the country's foreign policy, according to an op-ed by his foreign minister published in Bloomberg on Monday. "We are convinced that Brazil has a much larger role to play in the world than the one we currently attribute to ourselves," Araújo wrote.